Sydney Shop Girl: The First Friday of 2015. Fold Up Stroller Suggestions? The First Friday of 2015. Fold Up Stroller Suggestions? And just like that, my Santas, jingly bells and snow dome have huddled together as they prepare for another year of hibernation in the Christmas decorations box. It won't be long before the shelves at the supermarket are filled with Easter eggs and hot cross buns. I'm surprised it hasn't happened already. Though I suppose an aisle that begins with 90% off Christmas stock and ends with full priced Easter things mightn't make for the most appealing visual merchandising display. How could I forget? We've Australia Day to buy for in between. 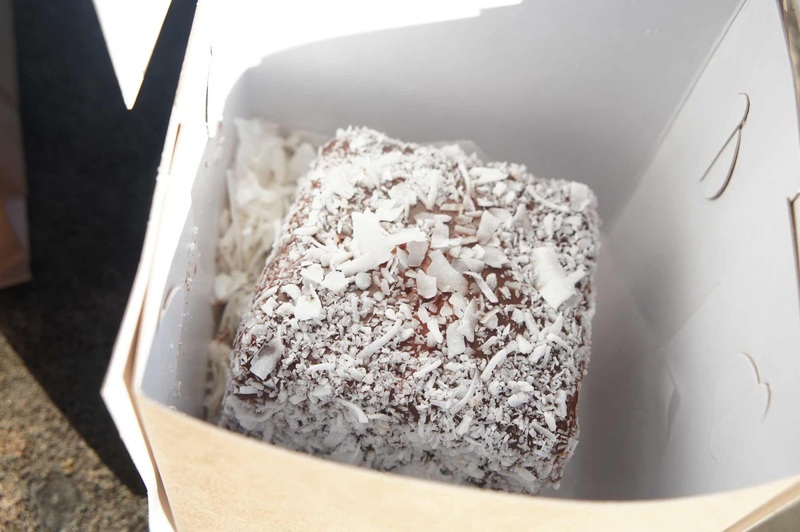 Be prepared for the lamington overload, readers. 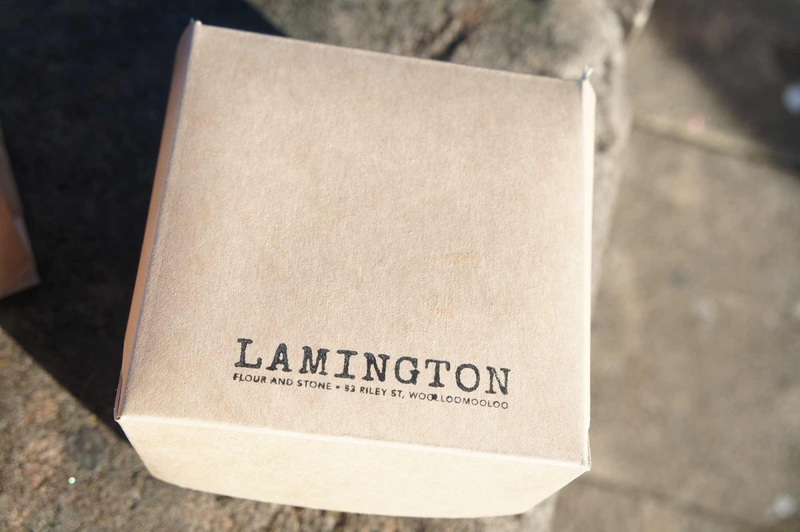 I might just get myself back to Flour and Stone later this month for another of these pannacotta lamingtons. It's a shame they don't freeze as well as hot cross buns because I'm sorely tempted to get a few extras for the freezer. But who knows, perhaps Colesworths will come to my rescue and create a lamington hot cross bun that they could sell with impunity for the six months of the year between Christmases. I marvelled at the ingenuity of modern car park design this morning. This is where my $2 coin landed on level 8. After it fell out of my pocket as I took this inspired selfie. The coin managed to bounce across to the recess and not fall straight down. Which meant that I did at least get my money back even if the photo was a bit of a fail. Denim skirt and belt from GAP at the Florida Mall a few months back. This is the actual outfit. Nothing like a lift selfie when you're one of the only people at work in the morning. There should be more days in the year where it's okay to wear a dark denim pencil skirt to the office. The necklace was a post Christmas bargain from Lovisa and the sleeveless shirt is that new one from Uniqlo. It seems I'm all about colour themed posts these days. I finally found myself some ramekins. These were from the Aldi half price special buy sale and were $4.80. Now that I've got them I can't remember what I needed them for in the first place. I might try my hand at pannetone bread and butter puddings in the next little while. Before I go, a quick pram / fold up stroller question. I think I need a new one because Toddler SSG is getting too tall for his Bugaboo Cameleon 3. Do any of you have a suggestion for a fold up stroller for taller toddlers? Hopefully in the middle to lower price ranges because I don't think it'll be getting that much use as the years go by. Thanks in advance and have a lovely weekend! The selfie wasn't a fail coz I got to see how fabulous your hair is looking! Good luck with the stroller search! I suppose it will be all too soon that baby T will be needing a bigger stroller too! I love your work outfit - that red necklace is a beautiful accessory. I've ordered something similar, a teething necklace but a very similar design, and now I'm wishing I'd ordered it in a more statement colour than I did. I love the work outfit :-) I'd recommend Maclaren strollers, which are popular in my tall family. They're also extremely light and fold up quite neatly. I think they're available in Australia, and possibly fall into the reasonable price bracket? Good luck with your search anyway! Definitely look into Maclaren for their strollers. We bought the cheapest one in the range and the almost 4 year old still loves riding in it. Ah I'm a little sad to see the Christmas decorations go away. Hahaha, my mum likes to keep it up until at least the 6th of Jan (i.e. her birthday). And that reminds me, I must plan a visit to flour and stone soon! Agree with the Maclaren recs. We used the Quest when TLP was a toddler. Build quality is great, and easy to use. We have a Maclaren Quest and it's been great. Managed to find an as-new secondhand one from Gumtree, which kept the price down for us. It even came with a travel bag! So true. They actually are pretty robust, just not enough under seat room for shopping, lah! The babyzen yoyo! Easy folding and unfolding. Light and easy to manoeuvre. Also, you can bring it on the plane when you travel as it folds to cabin size. I have used it on travels 4 times (domestic and international) and had no problems with it. However, not much storage space at the bottom and you can't hang too many shopping bags on the handle. It's pretty light so it might topple. Will check this brand out too. Thank you all for the stroller suggestions.